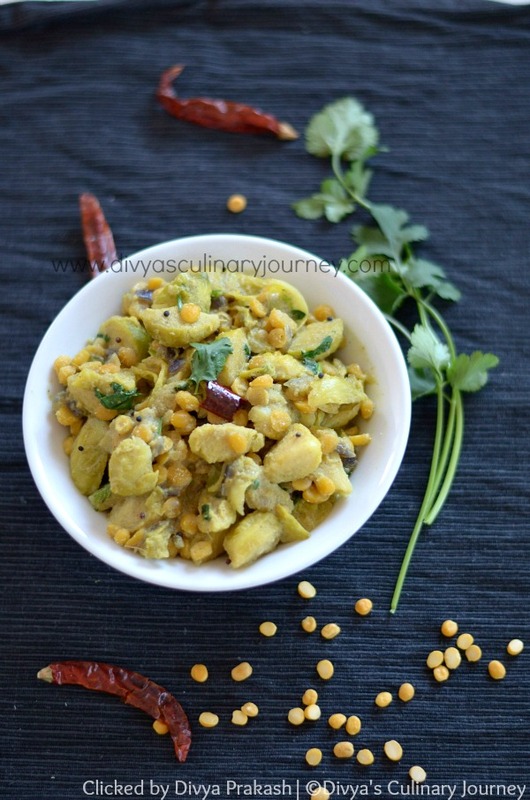 This is a South Indian style comforting dish made with Brussel sprouts using split bengal gram (Chana dal) and ground coconut. This is healthy and Vegan. Dried Red Chillies : 1-2 nos. Then grind all the ingredients listed under 'to grind together' into a smooth paste and set it aside. Then to the brussel sprouts, add the cooked channa dal along with the water, and the ground mixture, now add turmeric powder and asafoetida, mix well and check the salt and adjust accordingly and cook till the raw smell is gone. Then turn off the heat. 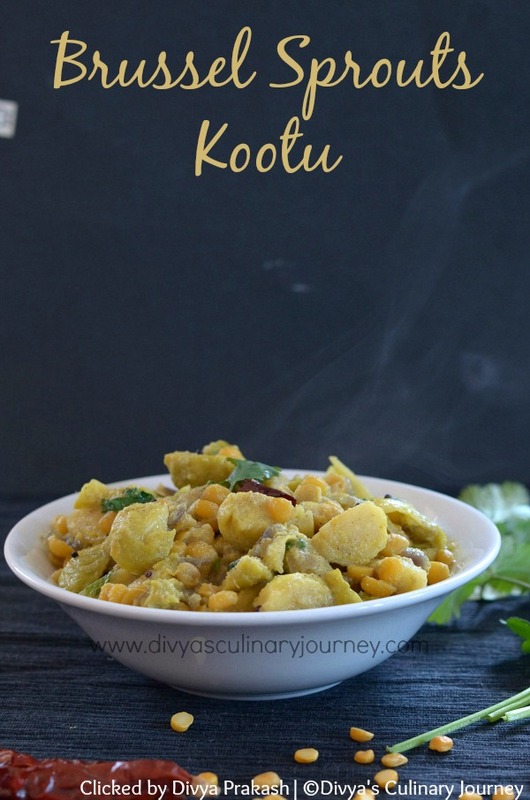 Instead of Channa dal, moong dal can be used for the kootu. I admire you for not giving up on your kids with Brussels sprouts. Good on YOU for finding a new way for them to enjoy. This kootu sounds delicious! I adore Indian cuisine, so flavorsome and yummy. I must admit though that I have never tried a kootu but it sounds lovely. I think this would definitely help get the family eating more Brussel sprouts! 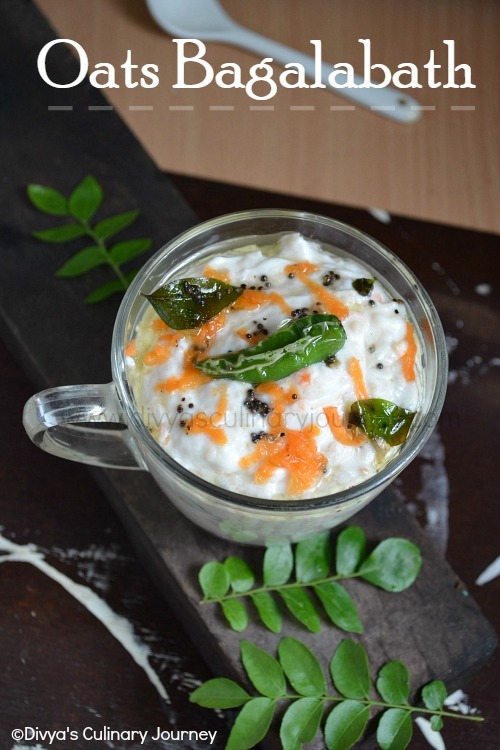 My kids too eat any vegetable in kootu, this is a versatile dish pairs well with dosa, roti, rice and adai too :) I make it the same way except ginger. Next time, try adding 1/4 cup moongdal along with channa dal...that gives more flavor and taste. Neat clicks Divya! Divya, your recipe looks fabulous. I would try it even though most of the ingredients outside of the Brussel sprouts are a mystery to me. It occurs to me I need to go to some Indian Restaurants and ask for Kootu! Then I will know if I get this recipe correct! Looks very tasty indeed! I love finding new ways to serve Brussels sprouts which is one of our favorite veggies. Yours looks so full of great flavors and i can't wait to try it! Thanks for posting this exotic comfort food; I would love to try this some day! Beautifully done. Great dish, love all the ingredients going into this one!! Super da.. I never imagined brussel sprouts in Kootu.. Flavourful and yummy kootu.. Beautiful clicks..
Beautiful recipe! Gorgeous flavours and stunning photos! I love Brussels sprouts and this dish looks very aromatic and appetizing!